Last week, we announced our November Gobbler Gaming Giveaway (NGGG), a month long contest that includes four (4) NVIDIA Tegra 2 powered tablets and a couple of gaming-inspired prize packs. Each week, we will hand out a different tablet, with the prize packs (Jamboxes and $25 gift cards) being tacked on to the last two giveaways. 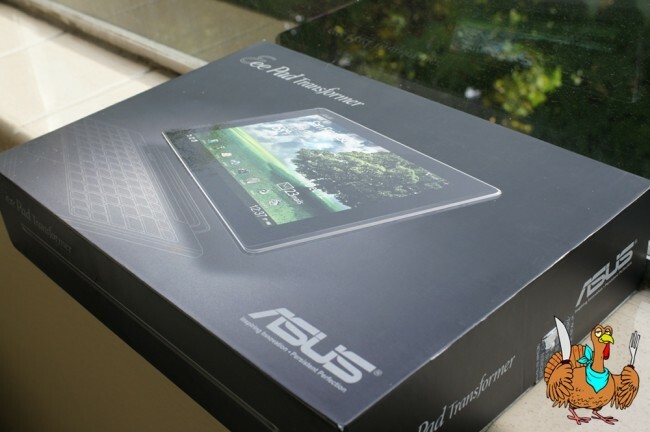 Up first was the Samsung Galaxy Tab 10.1 followed by the Asus Transformer this week that you are seeing in the photo above. This is hands down one of the top two Android tablets on the market today, even after being out for a number of months. Time for someone new to experience one of the most updated Android devices to date. CGull who would use his tablet primarily as a resource tool. Games, possibly. But mostly for Internet reading, info apps, etc. Nice piece of utility tech. Congrats on the new tablet! To everyone else, tune back in Monday morning for your chance to win the next tablet provided by@NVIDIATegra and the Tegra Zone. And so you know, next week we start with the two bundles that include a Jawbone Jambox speaker and $25 gift card.